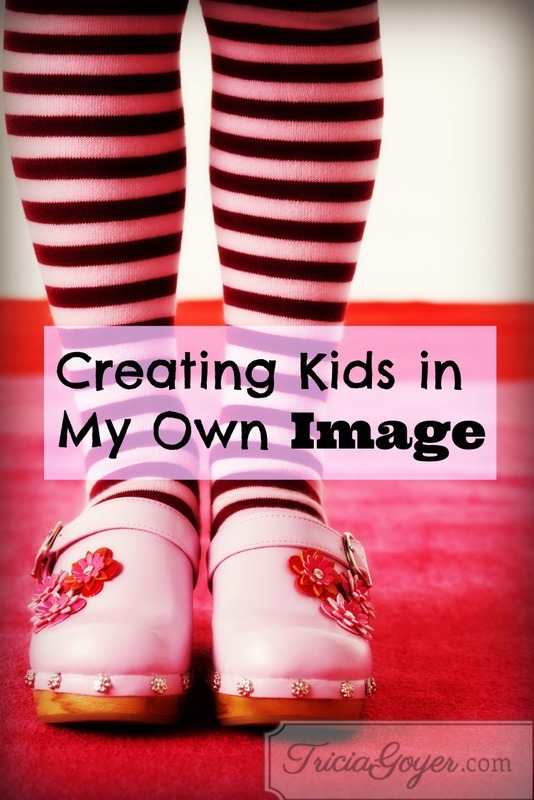 One thing that has always gotten me overbooked and overwhelmed was trying to create my children in “my own image.” No, I’m not talking about making mini-mes. I’m talking about the image in my mind. A mix of kid that looked like a Gap Kids model, played sports like baby Olympic athletes, and were as scholarly as miniature Albert Einsteins (without the frizzy hair). Then God reminded me I didn’t need to envision who my kids should be. He’d already taken care of that. My kids weren’t empty vessels after all. God created him in unique ways. Ephesians 2:10 talks about this, “For we are God’s workmanship, created in Christ Jesus to do good works, which God prepared in advance for us to do” (NIV). Just as God created me to do good works (in my family, my home, my community, my world), He did the same for my kids. Boldness came when I studied my kids and figured out what made them tick. While it wasn’t possible to look at my three-year-old son and know what he was going to be when he grew up, I discovered he liked listening to stories and building Lego creations. At age six I discovered t-ball was not his thing. In eight grade I discovered basketball was. It was hard though, focusing on my child INSTEAD of focusing on the image in my head. From the first moment I saw Cory my mind was filled with big dreams for him. My Mommy sensibility involved laying aside my dreams and discovering God’s. “When you are a mother, you are never really alone in your thoughts. A mother always has to think twice, once for herself and once for her child,” says actress Sophia Loren. The cool thing was God thought of my kids first. Instead of creating kids in my own image, I need to remember that God created them in His. He knows His plans for them. Plans for a good future. It’s my job as a mom to remember that, to seek God, and to appreciate my kids for who they are . . . without letting my idea of who they should be get in the way. Nix the idea of the “perfect” kid. Appreciate who God made your child to be. Ask God to show you how to help your child develop his talents. Thank God for your child’s good future! I thank you for my children. I thank you that you designed them with your good plans in mind. Help me to seek Your will for my children, instead of trying to make them match up to the unrealistic images in my mind. May you be glorified in and through my children! Our son did not know what he wanted to do when he finished high school. He enrolled in a junior college and my husband and I encouraged him to consider being a physical education teacher. After all, he loved sports and he loved children. A perfect fit, right? He applied for jobs, got interviews but there always seemed to be a teachers child that got the jobs. He substitute taught for a couple of years but it wasn’t consistent. To our surprise he told us he wanted to go to,nursing school. God had plans for him we knew nothing about. He has graduated and is now an LPN with plans to eventually go and get his RN degree. On top of all that his very serious girlfriend has type 1 diabetes and has had problems from time to time. His being a nurse is coming in handy. God always has a plan bigger and better than anything we could possible imagine! My kids are still little, but one of my prayers has been that they’ll discover their God-given talents and interests early so we can nurture them. And I’m learning it’s okay to let them do things at their own pace. It is hard sometimes, because I have my own ideas of what they should do or might be good at. But you’re right–God has his own plans for them that are better than mine could be. Hope I can hold onto that as they grow. I have loved to see my kids growing and blooming! My older kids are so unique, and I can’t wait to see what my younger kids will be like as adults. God amazes me! My husband and I started homeschooling our three boys when the oldest was just 4 or 5 (it all blurs together a little now). He is now a junior in high school and some days I struggle with that image in my head – especially when I have all the wonderful reminders of the lives of other boys his age thanks to Facebook. BUT – I just keep telling myself that God has designed him and his brothers. God has created interests, talents and abilities in each of them. My job – as stewards over these precious ones – is to help them nurture the uniqueness that God has placed in them. Thanks for letting me know that I’m not alone. You’re welcome, Kathryn. We need each other! Thus was such a timely blessibg to me, THANK YOU!